Two Banks Of Four | Just another football fan with Internet access, right? Manchester United’s loss to Real Madrid is without doubt one of their most painful in their recent history. In terms of feeling an injustice after a result, it’ll rank up there with the Champions League exit to Porto in 2004 and the Premier League title decider loss to Chelsea in 2010. Amongst all the doom, gloom and incompetent ref-bashing though, there are things to look at from a positive light. For the first six months of the season, United were damned with faint praise, sometimes less. Phrases such as “average team dominating an average league” and “worst United side in years” were constantly bandied about. This was unfair, because in all honesty, people are comparing a developing, transitional United team to the fully developed teams of 1999 and 2008. Surely a more accurate measure is to compare them to another transitional side, for example the United team of 2004-2006? That team was barely competing for the title let alone winning it, yet they ended up becoming one of the greatest sides in club history – so how good could this crop potentially be in a couple of years? The performances against Real Madrid show that there’s certainly a lot to be positive about. Injustice: Sir Alex Ferguson will still be raging but has a lot to be proud of. All rights to this image belong to Tom Jenkins and The Guardian. Bar a shaky opening 45 minutes at the Bernabeu, his side looked cool and intelligent. They smothered Real Madrid, defended with a plan and were dangerous on the break. Even with 10 men, they had Real on the ropes for the final 15 minutes. Jose Mourinho’s claim that the best side lost was quite clearly an attempt to curry favour with the United hierarchy – but it was also very true. If this tie had been 12 months ago, Madrid would probably have romped to victory. As it was, they edged through, aided by a pretty ridiculous refereeing decision. If these two sides were to meet in another 12 months, you’d think a United side with an extra year’s experience under their belt would be even more of a threat. Bear in mind that David De Gea, Phil Jones, Tom Cleverley and Danny Welbeck had never played a Champions League knockout tie before last month. Jonny Evans had only played a handful. Yet all of these players sparkled at some point over the two legs. Welbeck in particular was magnificent, while Rafael played Ronaldo in the second leg as well as anyone could. Clearly there is a lot of potential for the years to come. Coming of age: Danny Welbeck has won rave reviews for his displays in both matches. In the immediate future, a first domestic double since 1996 is still a possibility, as well as the opportunity to gain a record points total in the Premier League era. The players will need lifting but motivation has always been one of Sir Alex’s strong points. United used the heartbreak of last season’s title loss to spur themselves on this year. As Gary Neville has recently said, they have their “title heads on” and seem like they are determined to wrestle their crown back from Manchester City. Something similar could be on the cards from a European perspective. The rage and hurt they are currently feeling is exactly what Sir Alex will be telling them to remember next season. However, for the most part, things have turned out well for him. He fired Jose Mourinho, and his immediate replacement Avram Grant took Chelsea to the last day of the title race, and within touching distance of the Champions League (more than what Mourinho managed in his last full season). “Big Phil” Scolari was sacked halfway through the 2008/09 season, but his immediate replacement Guus Hiddink won the FA Cup. And of course most recently, Roberto Di Matteo became arguably the most legendary caretaker of all time – guiding the side to the FA Cup and their first ever Champions League. So taking all this into account, you can’t blame Roman for feeling a tad smug. Almost every time he fires a manager, to the disapproval of many pundits, his chosen replacement ends up delivering a good degree of success. Instability and knee jerk reactions appear to be the route to success in this regime. 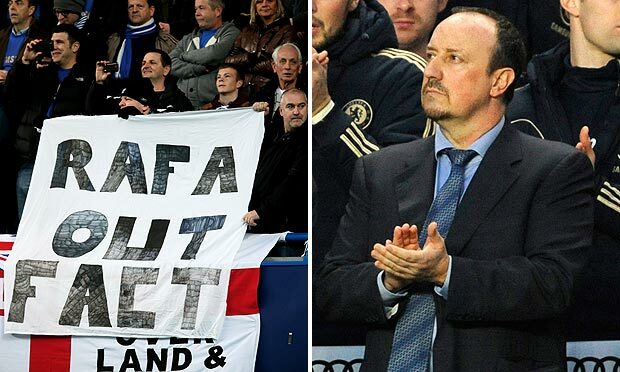 However, with the appointment of Rafa Benitez, this may be one of those occasions where Chelsea’s owner regrets his managerial merry-go round. Not only is his interim boss somewhat of a hate figure for many Chelsea fans, but he’s not been given the key luxury which was afforded to the likes of Grant, Hiddink and Di Matteo – an experienced, powerful Chelsea side. 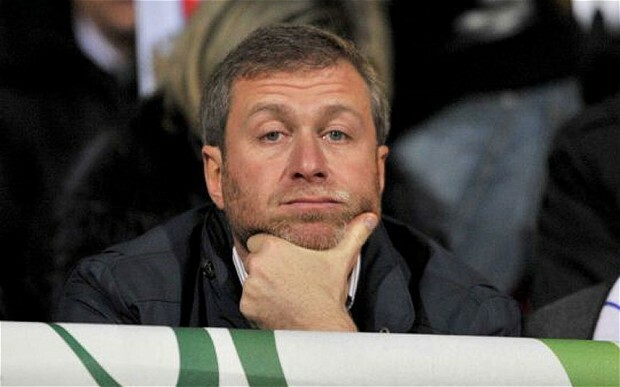 Maybe not this time: Abramovich may be regretting his approach. All rights to this image belong to Rex and The Telegraph. Although a manager is undoubtedly important, at Stamford Bridge it sometimes feels as if the players are more important, and the success is almost solely based on their abilities and mindset. Grant may not have been the most able or popular coach, but he was blessed with a Chelsea side bang in their prime. Cech, Terry, Lampard, Essien, Ballack, Drogba and the 2 Coles all in their peak years. Makelele still around. He was an average coach in charge of a formidable squad. Hiddink, who took over less than a year later, had largely the same group of players, whilst Di Matteo was able to eke out the final drops from the veterans. Out went the AVB introductions such as Romeu and Sturridge, in came the likes of Lampard, Mikel, Drogba and even Kalou. Benitez however doesn’t have this benefit. Drogba, for so many years the symbol of the Chelsea side, has departed, while the three English veterans are not the players they once were (credit to Lampard for a decent renaissance though). They’ve also had absences from the side due to injuries and suspensions. In other words, unlike the other managers who’ve stepped in when Abramovich has fired someone, Benitez can’t rely on going back to the tried and trusted methods. He has a team in transition. Rocky Rafa: Benitez hasn’t had the best of starts. All rights to this image belong to Getty Images. The likelihood of Chelsea challenging for the Premier League is slim to say the least – the gap between them and Manchester United has increased by 7 points since he arrived. They suffered a surprise League Cup exit to Swansea last week, while they will need a replay against Brentford to progress in the FA Cup. There is no question that Abramovich would have been hoping for a similar level of success to his other short-term appointments. By the time the season ends, he may have to admit that the big pay-out given to Di Matteo, as well as the dissent amongst the Chelsea fans, could all have been avoided. Considering this blog is called Two Banks Of Four, you could be forgiven for thinking it was being written by Roy Hodgson himself. After all, he has built a long and respectable managerial career out of this most basic and English of formations. However, with his side’s 2014 World Cup qualification campaign due to get underway this week, and memories of their Euro 2012 performances still fresh in the mind, the two qualifiers against Moldova and Ukraine may be a chance for Hodgson and England to belatedly enter modern day football. The phrases “well-drilled” and “disciplined” were some of the more positive words used to describe Hodgson’s England during the Euros. Unfortunately, “rigid” and “wasteful” were equally valid descriptions. The sight of watching England’s 4 midfielders running from side to side whilst the opposition attempted to play their way through was pleasing to some. The sight of watching them give the ball away within seconds of winning it back was anything but. Their quarter-final defeat to Italy saw them with a mere 32% of possession (described by Jamie Carragher as the statistics of a Championship side playing a Premier League side in the FA Cup.) They were outpassed 833-364, and had only 8 shots to Italy’s 31. The fact that they made it to a penalty shoot out was down to brave defending, poor Italian finishing, and good fortune. 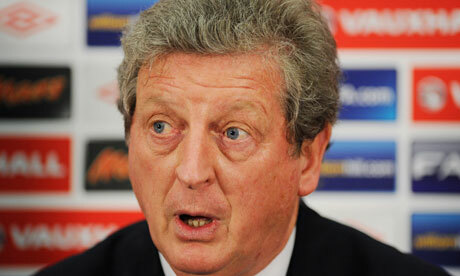 Rigid Roy: But will Hodgson change his ways? All rights for this image are reserved by Tom Jenkins for The Guardian. Hodgson was forgiven in many quarters for his use of formation in that tournament. After all, he had only taken charge of the national side six weeks beforehand. Therefore it made sense to do what he knew best. Two banks of four, keep your shape and grind out the results. The unavailability of midfielders such as Jack Wilshere, Tom Cleverley and Michael Carrick also meant that a stylish brand of football was never going to be the order of the day. Now there will be no such goodwill if he persists with an outdated way of playing. His Liverpool reign was notable for much criticism, partly due to his tactical approach. He strongly defended himself, stating: “It is insulting to suggest that because you move to a new club, your methods suddenly don’t work when they’ve held you in good stead for 35 years and made you one of the most respected coaches in Europe”. He also defended his use of the 4-4-2 during the Euros, and despite expressing disappointment that his players did not make better use of the ball, has frequently claimed that possession statistics do not concern him. In fact, one of his early England training sessions consisted of him telling his players to not “just play short passes” and “Don’t be afraid to knock it up to the big man”. Not the most encouraging signs for English fans hoping to see more progressive football. 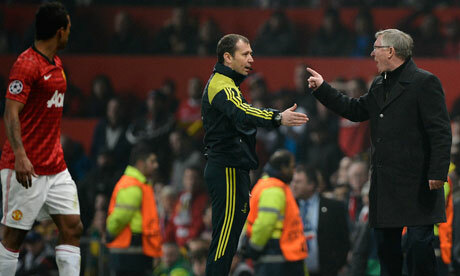 However, the recent friendly against Italy suggested that England and their manager may have learnt their lessons. A 4-3-3 formation saw the returning Carrick demonstrate the value of patience, positional sense and class on the ball, in stark contrast to Scott Parker’s headless chicken offerings. Alongside him, Frank Lampard was equally mature with his passing, while debutant Cleverley combined quick movement and short passes with the “X Factor” ability to make things happen in between the lines. Although just a friendly, it was one of the most accomplished English performances in recent years, thanks largely to the change in the middle of the park – both in formation and personnel. Pass Master: Carrick’s ability to retain possession is key. A front 3 with genuine pace and trickery in the wide areas, rather than the graft of James Milner, will enable England to stretch teams when necessary, and the likes of Theo Walcott, Alex Oxlade-Chamberlain, Daniel Sturridge and Adam Johnson all fit the bill. Although he is currently uncapped, Nathan Dyer may also be one to watch, having been in great form for Swansea over the last year. As for the centre forward position, the injury to Andy Carroll may be a blessing in disguise, as Sturridge or Danny Welbeck both offer more mobile and technical options. There is of course the chance that Hodgson was merely experimenting in Berne, and will now revert to his tried and trusted methods for the qualifiers. Captain Steven Gerrard was rested in that match but will return, and already there are rumblings of him starting alongside Lampard, which would represent a significant backwards step. John Terry is also back, although England may be better off with a centre half partnership of Gary Cahill and Joleon Lescott, which offers more pace and better ball playing ability. The next 2 fixtures are certainly winnable for England. Whether they are achieved in a style which suggests they are moving forward is another matter altogether. Over to you Mr Hodgson. It goes without saying that the loss of one of your star players, a man who scored 35 goals last season and is currently the club’s 4th highest goalscorer of all time, should be a cause rather than a cure for managerial headache. But when Sir Alex Ferguson analyses the situation, he may feel differently. It was already well documented before Manchester United’s 3-2 win over Fulham on Saturday, that Wayne Rooney’s opening game performance at Everton was disappointing (although the same could be said for many of his team mates). Indeed, his manager’s decision to bench him for the Cottagers’ visit was seen by many as a necessary kick up the backside. For a long time, Rooney seemed to have near undroppable status. Bouts of poor form and even on pitch strops at team mates, which seem to have surfaced in the last 2 years, went without significant punishment. Now, this may not be the case. Things to ponder? 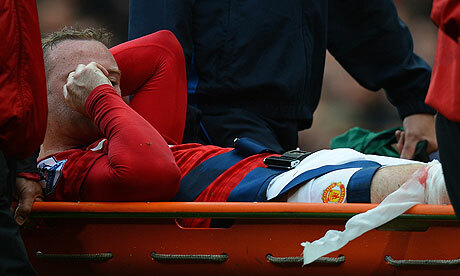 Wayne Rooney is stretchered off against Fulham. All rights to this image are reserved by Andrew Yates/AFP/Getty Images. Rooney’s two preferred positions are as the Number 9 or the Number 10. Goalscorer or playmaker. The reason for his undroppable status was that he was by far the best option in either position. Summer acquisitions have changed this. Robin Van Persie, the only player in the Premier League to score more than Rooney last season, is at the very least his equal as a Number 9. Shinji Kagawa, last season’s Bundesliga Player Of The Year, offers a far more fluid and skilful option as a Number 10. 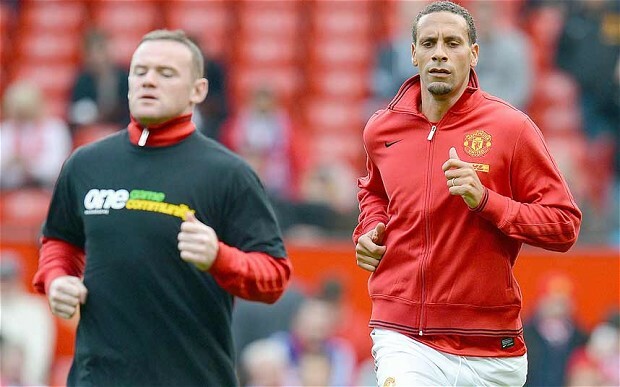 Both have had excellent starts to their United careers and this is the reason for Sir Alex’s headache. It seems folly to change a winning and attractive combination, but so is leaving out a player of Rooney’s calibre and experience. He could of course be moved into a wide forward position (i.e. David Villa), but United have a plethora of wing options already. Increased competition is a good thing, but it depends on how well the resources can be handled (particularly when one of them happens to be an A-lister). The emergence of Javier Hernandez in 2010/11 would surely have motivated Dimitar Berbatov, but it didn’t make a blind bit of difference as the Mexican’s form and ability to increase his team’s cohesion meant he regularly kept his place. Hernandez then went through the same thing himself last year due to the emergence of Danny Welbeck. Generally speaking, there will always be 2 forwards who play the bulk of the games. People like to point out that the Treble winning side of 1999 had 4 forwards who didn’t mind rotation (although there was still a clear first choice of Yorke and Cole) but that was a very different situation. Teddy Sheringham was 33, whilst Ole Gunnar Solskjaer had the rare personality of somebody who was happy to play Supersub despite his considerable talent. You wouldn’t say that about Rooney, Van Persie or Kagawa would you? Flying start for the Dutchman: Van Persie opens his United account. Some United fans have bemoaned the loss of the raging bull Rooney, who could turn a match in an instant and terrorise opposing defences with pace, power and skill. He seems to have gone from somebody who drew comparisons with Gazza and George Best, to somebody who’s “just” effective. I say that in inverted commas because we shouldn’t devalue what he currently is. He’s become one of the world’s top centre forwards. His goal record over the last 2 years for United stands at an extremely impressive 51 in 86, and the majority of managers in the game would snap him up in an instant if they could. However, there is the nagging sense of regret that he could, and maybe still can be, so much more. Whilst his finishing has improved immensely, his all round game has deteriorated over the last year. How often does somebody score 35 goals and still not get voted as his club’s player of the season? That says as much about him as it does for the actual winner, with all due respect to the brilliant Antonio Valencia. Rooney’s nasty looking gash is expected to keep him out for around a month, which is undoubtedly robbing both club and country of a world-class option. But had he not suffered the injury, that may have been all he was at Old Trafford for a while – an option. His lay-off temporarily eases the selection dilemna for his manager. Of course, loss of form/injuries to other players are all perfectly likely, which means he could get back in the team and keep himself there with good performances. However, should Van Persie and Kagawa continue to flourish in his absence, his return will bring back this unfamiliar headache for his manager. As you can see, this blog is currently in its infancy, so I’ll keep it short and sweet. Welcome to Two Banks Of Four. I’ll be looking to post on here more frequently over the next few months and although I’m a novice blogger, I can guarantee that every post will have maximum thought and passion put into it. There’s nothing like The Beautiful Game to get the juices flowing, and I’m just glad I’ve got an outlet. I hope you find this blog insightful and maybe even a tad humorous. Don’t be afraid to leave comments, and enjoy your read!